I was pretty excited when I first spotted this cereal on the shelves of a Target store in Burbank, CA. It stood out from all of the other cereals with its slick dark box and an image of cereal that seemed to contain significant pieces of real chocolate. It looked like a chocolate lover's dream. Reality doesn't quite live up to the idealistic picture on the box, but it is a decent cereal. The star of this cereal isn't the chocolate-like pieces, but rather the smattering of cocoa-infused corn flakes which provide the majority of flavor. Those flakes are crisper than the regular corn flakes in the mix. The "chocolatey" pieces provide more in the way of texture than they do flavor. As with similar "chocolatey" pieces in Kellogg's Special K Chocolatety Delight cereal, some people might find these piece slightly off-putting. Eaten alone, they're slightly waxy and have very little chocolate flavor. I guarantee if they made a chocolate bar out of this stuff, you would not like it. 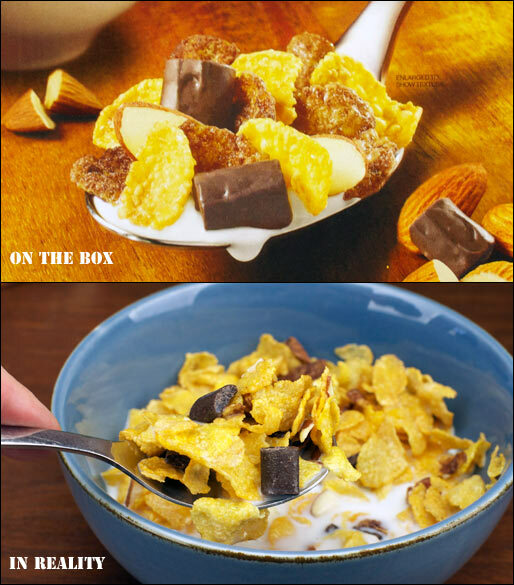 However when those small pieces are eaten within the context of the almonds and the two types of flakes, your mouth gets fooled that the "chocolatey" pieces are providing chocolate flavor. It should be noted that the amount of almonds in the cereal is quite impressive. For the most part, I enjoyed Rocky Mountain Chocolate Factory Chocolatey Almond Cereal. There's a lot going on in the way of flavors and textures. It satisfied my craving for chocolate even if it went about it in a weird way. I yearn for the day when Kellogg's uses the word "chocolate" and not "chocolatey" to describe chocolate-like pieces in their cereals. After eating a bowl of this product, my basic reaction was "pretty good, but I wonder what it would be like with real chocolate." Since this is a limited edition cereal, I recommend you try a box for the novelty of it. I think you'll enjoy it, but I doubt you'll be tempted to buy another box. Nutritional Considerations: Each 1 cup serving of Kellogg's Rocky Mountain Chocolate Factory Chocolatey Almond Cereal has 210 calories, 4 grams total fat (2 grams saturated and 0 grams trans), 0mg cholesterol, 200mg sodium, 42 grams total carbs, 1 gram dietary fiber, 18 grams sugar and 3 grams protein. 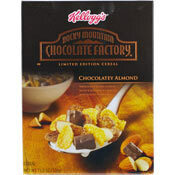 What do you think of Rocky Mountain Chocolate Factory Cereal? 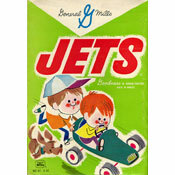 Hey Kellogg's - Start making this cereal again! I'm so sad that this cereal is gone. Too bad it is discontinued. Only cereal that worked for me... I am tired of the high sugar content in other cereals! I loved this cereal because its made for the adult not for a child.... having kids just makes me eat what they get but this one is the one that made me fall in love with cereal again... sad thing is I can't find it anymore. I found this cereal while working in Louisville. From the first bowl, I thought this was my favorite cereal ever. I hope they start selling it back home! Love this cereal... a chocolate cereal for grown ups! In my opinion, this is the BEST cereal ever. Is the chocolate really from the Rocky Mountain Chocolate Factory? It does not say on the box that it is. Great. The only cereal my grandson will eat!! Wonderful taste. I hope Kellogg's keeps producing this product. Not worth it. Chocolate pieces taste like Ex-Lax. If they're going to make a cereal, at least make it taste worthy of the calories. Very good. I love it!! As a real chocolate cereal fan, pass on this one. Poor mouth feel and the cheapest chocolate flavored coating left me disappointed as the package promised so much. Kellogg's makes some pretty decent chocolate cereals, this isn't one of them. My name is Linda. I am 66 years old too and I love this cereal. I want to buy the bigger box. I love the fake chocolate too. It is all so good. I hope they keep making it. I better stock up just in case. I'm going to buy more boxes before they stop making it. I loved it. Speaking for all the Chocoholics out here... this is soooooo good! I don't usually get excited about cereal, but this one is AMAZING! In fact, I loved it so much (both dry and with milk) that I went back to the store today and bought three more boxes. The chocolate pieces are a little weird, as noted in the review, but the whole mixture just works. Love it. I love this cereal! It's different, but not too sweet. Really hit the sweet spot. I love this cereal. I hope they don't change the recipe. It's perfect. My favorite cereal to date and I'm 66 years of age! Very good. I like the flavor. 2 thumbs up!